As of today, December 7, 2018, the US market (as measured by the S&P 500 Index) has fallen about 6% over the last three months, resulting in many investors wondering what the future holds and if they should make changes to their portfolios. While the S&P 500 Index may still be in positive territory for the year-to-date, it may be difficult to remain calm during a substantial market decline, it is important to remember that volatility is a normal part of investing. Additionally, for long-term investors, reacting emotionally to volatile markets may be more detrimental to portfolio performance than the drawdown itself. If one was to try and time the market in order to avoid the potential losses associated with periods of increased volatility, would this help or hinder long-term performance? If current market prices aggregate the information and expectations of market participants, stock mispricing cannot be systematically exploited through market timing. Translation: It is unlikely that investors can successfully time the market, and if they do manage it, it may be a result of luck rather than skill. Further complicating the prospect of market timing being additive to portfolio performance is the fact that a substantial proportion of the total return of stocks over long periods comes from just a handful of days. Since investors are unlikely to be able to identify in advance which days will have strong returns and which will not, the prudent course is likely to remain invested during periods of volatility rather than jump in and out of stocks. Otherwise, an investor runs the risk of being on the sidelines on days when returns happen to be strongly positive. The following chart helps illustrate this point. It shows the annualized compound return of the S&P 500 Index going back to 1990 and illustrates the impact of missing out on just a few days of strong returns. The bars represent the hypothetical growth of $1,000 over the period and show what happened if you missed the best single day during the period and what happened if you missed a handful of the best single days. 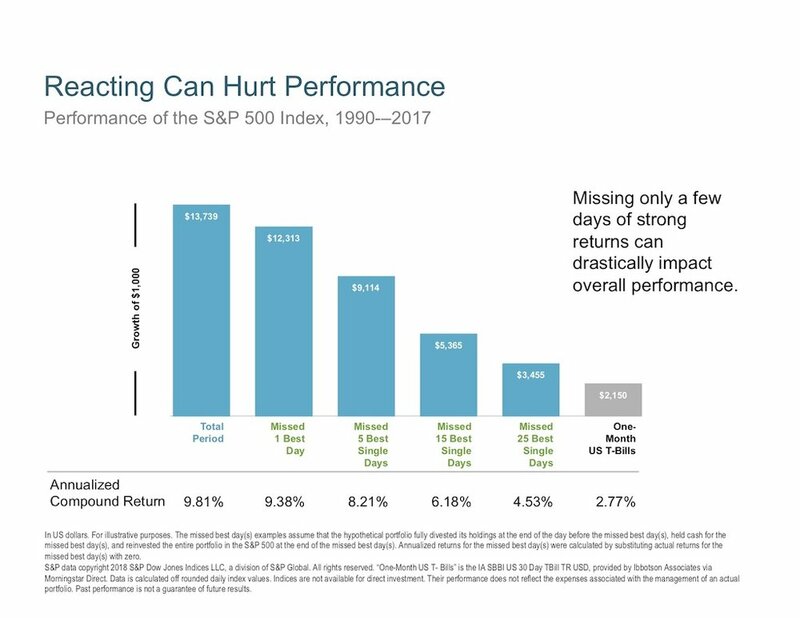 The data shows that being on the sidelines for only a few of the best single days in the market would have resulted in substantially lower returns than the total period had to offer. In other words, stay calm and stick to your plan. This week, the creator of Marvel Comics, Stan Lee, passed away. In case you aren't familiar with Lee's work, he created or co-created some of the world's most popular comic book characters: Iron Man, The Incredible Hulk, Thor, Spider-Man, Dr. Strange, and Black Panther are just some of his creations. In honor of Lee's work, it seemed appropriate to revisit a basic principle investing, diversification. You're probably wondering what comic book characters have to do with investing. Consider The Avengers, a team of superheroes who work together to save the day (most of the time). Individually, they can't succeed because each of them has strengths and weaknesses. Put them together and they are nearly unstoppable. Will there be ups and downs? Yes, but in the end everyone is better off working together. When you invest, the concept of diversification works the same way. The short answer is that diversification means not putting all of your eggs in one basket. Iron Man is great. Seriously, who wouldn't want Tony Stark's brains, money, and sweet armor? However, when the fate of the world is at stake, as it always is, the odds of saving the day are vastly improved when Iron Man is assisted by Captain America, Thor, Hulk, Black Widow, and Hawkeye. If Iron Man gets knocked down another member of the team can step up and get the job done. Let's use Apple as an example of how diversification works in the world of personal finance. Apple is a highly profitable tech company. However, owning a portfolio comprised only of Apple stock is not a good long-term strategy. Let's say Apple's stock falls 20% because consumers stop buying iPhones. You won't be a happy camper if Apple is your only investment! You need to create your own team of superheroes! Unfortunately, the team you'll create won't feature a giant green rage monster or a Norse god wielding a magic hammer. Instead, your team will be comprised of companies in different categories, such as Wells Fargo (financial services), Exxon Mobile (oil & gas), Pfizer (pharmaceutical), and Proctor & Gamble (consumer products). Why companies in different categories? Because it's impossible to predict which categories will be best from year to year. The following chart shows returns for different investment categories from 1998 - 2017. I know it's difficult to see exactly what's going in this chart. The different colors represent different categories of assets. For each year, the best-performing assets are at the top of the page and the worst-performing assets are at the bottom. As you can see, it's rare for the same category to consistently be number one - or two. Okay, we've established why having one superhero (stock) isn't ideal. The following chart shows a hypothetical portfolio comprised of five superheroes (stocks). Please note the stocks referenced here provides a highly simplified illustration of how diversification works. Spoiler: Instead of a 20% loss, you have a 3% gain. Congratulations, your superhero stocks have saved the day! Instead of a 20% loss, you have a 3% gain!! For the average investor, owning a portfolio of individual stocks, such as the one in the example above, isn't practical. Fortunately, mutual funds and exchange-traded funds (ETFs) provide investors with an efficient, cost-effective means of holding large baskets of stocks and bonds. Owning one stock (or having Iron Man on your side) is great, but it's risky and could lead to losses (or the end of the world). On the other hand, owning multiple stocks in different categories (or multiple superheroes) typically reduces risk and leads to better long-term returns (or the world not ending). I've just proven that reading comic books or watching movies based on comic books is not a waste of time. Thanks, Stan Lee! I know many of my friends and clients were surprised by the results of last night's election. Adding fuel to the fire, it didn't help that markets fell sharply as reactions to a Trump presidency spread across the world. The Dow was off over 800 points, more than a 5% decline, and futures trading on the S&P 500 temporarily halted. The results of the election and its impact on financial markets will be discussed adnauseum in the coming days (well, probably weeks). The topic of incorrect polls is likely to come up, which is understandable because, in addition to the US election, polls for the Colombia-FARC peace deal and Brexit were wrong. Just remember that markets calmed down quickly after the Brexit vote rocked financial markets. In fact, it's now about 11:30AM EST and US markets have already stabilized - and are in positive territory. I cannot predict what will happen over the next four years. No one can. In addition, it's questionable just how much any president can affect the economy. Markets will go up and down, but there's nothing you can do about it. I coach my nine-year-old daughter's soccer team. The kids often complain the actions of the opposing team or calls made by the referee aren't fair. My response is always the same. I ask them the following question: "Who can you control?" They eventually respond with something along the lines of "No one" or, the answer I'm really looking for, "I can only control myself". Don't worry about the financial markets because you can't control them. Instead, focus on the things you can control. I know that's easier said than done, especially if you're nearing retirement or already retired. What I do know is that my investment strategy hasn't changed since yesterday. There are a lot of planners excited about improving the financial planning profession. I believe the XYPN had about 100 members in 2015. The network has grown to more than 300. And we will act in our clients best interests. Not because we're forced to, but because we want to. And it's the right thing to do. Student loans are a big problem. There are millions of people who need who need help navigating confusing loan types as well as their repayment and refinancing options. I've started work on a project to address this problem. Robo-advisors, such as Betterment and Wealthfront, cannot replace a human. Sure, they can invest efficiently, but their algorithms can't handle disruptions in financial markets (Brexit) nor can they hold their clients' hands while on life's emotional roller coaster. And a human financial planner augmented with a computer? That's a force to be reckoned with. I told the audience my wife and I came to an agreement when I started my firm: She was now the primary breadwinner and working a demanding job at a public affairs firm. Naturally, my income had decreased because I was building my firm. I may not have been able to contribute to the household financially, but I could contribute in other ways. I could drop-off and pick-up the girls from school and take the lead on laundry, grocery shopping, and cooking. So that is what I did. Later that day, one of the attendees approached me and said he called his wife after attending my panel discussion. He told her that while launching his firm he was going to take over drop-off and pick-up, laundry, grocery shopping and cooking. Loads of great information about all aspects of financial planning. Survivor: Millennials vs. Gen-X. This long-running reality show has become something of a family tradition in our house. The four of us enjoy watching the physical challenges, scheming, and strategies every season. In addition, our nine-year-old has declared that she plans to win when she's old enough to compete. Oh, and that's after she wins American Ninja Warrior. And becomes a professional soccer player.